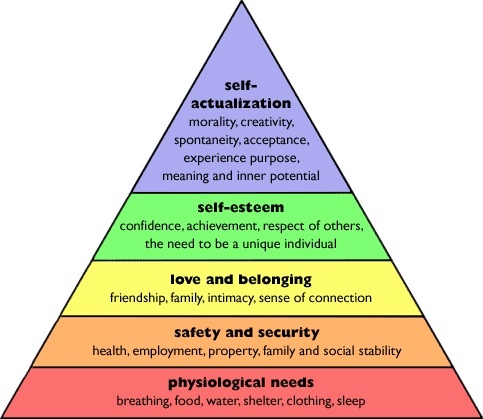 Maslow’s Hierarchy of Needs (illustrated to the left) isn’t the only list of purported needs. Famed American psychologist Edward L. Thorndike did his own research on the needs of mankind. And there are others. Each of them have their merits, and proponents – as well as critics. You’re always looking for an edge. Some insight. That’s what Maslow put at the top of his pyramid. According to him, you’ve got to make sure you’ve got those four other things underneath your feet first. Watch any survival reality show and the evidence is clear. They always go after the first two blocks of the pyramid. The basic essentials have to be in place before you can think about anything else. No food. No safe place to sleep. Nothing else matters! The guy talks about all his credit card debt. It’s approaching $10,000. He’s battling to find enough cash flow to buy food. Forget the house. It’s gone. The car? His mom gave him hers. He’s got dreams of making it big. There’s a SasS (software as a service) business in his head that he knows can earn millions. Maybe. Maybe not. So far, he’s got a bunch of notes, some drawings, a mindmap or two and seemingly, a lot of misplaced optimism. It’s their credit card debt that may helping some marketers generate 5-figure monthly revenues. As for our future Saas entrepreneur, he’s among the ranks of many I’ve seen in the past ten years. I watch with heightened curiosity, hoping he figures it out soon. I’m not optimistic though. Not because I’m a pessimist, but because I’ve seen this movie before. It just hardly ever ends well. It’s not a comedy. It’s a tragedy. Lately, I’m not in much mood for tragedies. He says he doesn’t want to work for anybody ever again. Nobody gets rich, nobody is successful if they work for the man. Or WOman. He believes it. Evidence? He’s always worked for the man and he’s poor as Job’s turkey. Today’s show is about two (just 2) big ideas. They’re not complicated, but they are profound. They may be just what you need, too – because there just aren’t very many of us who don’t need them.